RID Bruticus pictures and more! Thanks to Super Clear Cybertron, you can now find pictures of Bruticus from RID. Ground Zero found pictures of the prototype Spychangers and Deluxe sized RID Combiner Figures. Still wish Hasbro would get a clue and use the term "Gestalt". Win a MISB Starscream reissue!!! We've teamed up with Action Figure Xpress to bring you a brand-spankin' new contest! Just tell us who your favorite Transformers action figure is and you could win a MISB Starscream Reissue from Action Figure Xpress! Register today! Thanks to Ground Zero, find pictures of 2 of the "Robots In Disguise" Decepticon jets (two Machine Wars repaints) here! Thanks to transfandom.com, you can now see pictures of the all-new totally original Spychangers. Prowl 2 & Side Swipe can be seen here and Daytonus & Side Burn can be seen here! Supreme Optimus Primal and Megabolt Megatron ... where are they? Rumors: According to Ben Yee, Megabolt Megatron and Supreme Primal are NOT on the 2001 toy release schedule. There might be a slim chance that the figures will be released next year. Unfortunately, Hasbro has neither stated this nor denied this. Transfandom.com reports that Bluestreak might be the next G1 reissue from Takara. Site News: I am about ready to unveil the Masterforce section of images. There's a little over 600 images that will be a part of this section. Look for it sometime Sunday or Monday. Market Watch: I still have Blast Punch Optimus Primals for sale. You can purchase them through my listing(s) on eBay or buy them from me privately for $30.00 a figure. Market Watch: The local K-Marts in West Michigan has all Beast Machines figures marked at 50% off. All other major retail stores (WalMart, Target, Meijer, and ToysRUs) in West Michigan are carrying the new Transformers RID figures. In Reviews: Added a review of Blast Punch Optimus Primal. On eBay: SEIBERTRON.com is selling extra Blast Punch Optimus Primals. Get yours today! The first regular update to the site since the redesign! Saysadie's review of Blackarachnia is added to the site! Kids not only say the darndest things, but when they speak as one, they get things done. Ask Alfred C. Carosi. Carosi is a corporate vice president of marketing services with Hasbro, a toy company. Hasbro happens to be the creator of Transformers, a popular children's program featuring a range of robots as heroes and villians. They're called autobots. Locally, the series can be seen at 4 p.m. Monday through Friday on KMSS, Channel 33. 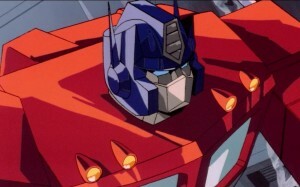 Hasbro, in an effort to revamp its toy line pertaining to Transformers, used its feature-length film of the same name to kill off Optimus Prime, leader of the good guys on the TV series. The philosphy of Hasbro in terms of toy product is to turn its entire line every two years and introduce new toys. The company thought the feature film a good place to kill off Optimus Prime and give a reason for his disapearance from the toy line. "There was immediate reaction," says Carosi. "We got a lot of phone calls and letters from kids. We were frankly surprised at the number of letters. When we killed off Optimus Prime, I thought they might be a little bit upset, but we had new heroes for them in the movie. That didn't seem to matter." So for the first time, Hasbro brought back a series figure. Optimus is back on the TV show, but he's still out of the toy line. "We did it because the kids seemed to really like him. He's in all the new episodes, but he wasn't a part of the series after the movie. That could be confusing because we killed off a bunch in the movie... easily half a dozen. "We didn't get any letters about any of the other characters. Based on that, we took a look at bringing Optimus back. If Bobby Ewing can come back, why not Optimus Prime?" In the storyline returning Optimus, Carosi says, the reaction was fantastic from the kids. Generally speaking, he says, Transformers ratings were up in major markets like New York and Chicago, where Hasbro is headquartered. Although Optimus doesn't find himself in the toy line right now, Carosi says Hasbro is seriously looking at bringing the toy back next year. Oddly, Optimus was not the leading toy in the Transformers line. He sold for $20. Carosi says some of the lower-priced ones sold better. Of the larger toys, Optimus was No. 1 at his price range. "Optimus was leader of the good autobots, I guess that's why he was so popular. He was replaced in the movie by Rodimus Prime, who is the hero in the new episodes. Optimus came back and took over in a two-parter. He was Rodimus' father figure. "Well, we've done it and we learned. The key is to be responsive to the kids, not upset them. We did that inadvertently. By definition, what we do should be fun." Carosi says the feature-length film did well and engineered good responses from kids. It is now being readied for videocassette release. "Hasbro probably won't do another film," Carosi says. "They are very expensive to produce. We lost money on Transformers and My Little Pony, which we also created." Hasbro's most popular creation is the G.I. Joe animated show. Transformers is No. 2. G.I. Joe was created in 1964. Carosis says, in 1982, G.I. Joe was made into action figures. "There's no one G.I. Joe now. He has become a G.I. Joe team. By the way, the good figures outsell the villains." The lead seller for the bad guys is a figure called Cobra Commander, who appears on G.I. Joe. As for Optimus Prime, he seems to be secure now. Hasbro has learned not to tamper with him. After all, he has an army of youngsters backing him. Editor's Note: This newspaper article was obtained through Linden High School's micro-fiche film library during my senior year in 1995. Linden High School is located in Linden, Mi. See ... it pays to save all that stuff!! !